Thanks to hunters' trophy fees, hundreds of ranchers are providing the land, personnel, and capital that has resulted in greater numbers of some species in North America than now exist in their original native habitat. A Sportsmen on Film DVD production. Thanks to hunters' trophy fees, hundreds of ranchers are providing the land, personnel, and capital that has resulted in greater numbers of some species in North America than now exist in their original native habitat. 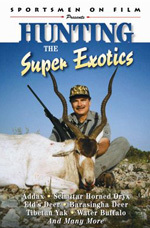 In addition to the on-camera hunting of Addax, Scimitar Horned Oryx, Eld's Deer, Barasingha Deer, Tibetan Yak, and Water Buffalo, you will see over 25 other species introduced to North America including Nilgai Antelope, Dama Gazelle, Nubian Ibex, Red Sheep, Reindeer, Hog Deer, Pere David Deer, Feral Hog (yes, they were imported centuries ago), Markhor and many more.